Black crepe (61% Rayon, 39 % Nylon). Vest. Sleeveless. Hidden snap button closure. Partially lined. 32" from shoulder to hemline. Imported. Great for maternity work clothes in the summer. Fabric was soft and high quality. 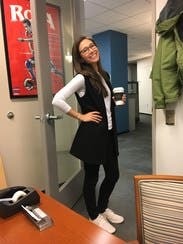 Vest was a fun way to mix up my work wardrobe. Even on a petite frame this was very flattering. The pockets made it really functional too. Goes great with everything and can be dressed up and down thanks to the quality material. Makes anything look work appropriate! The perfect vest to dress up a blouse and pants when you don't want to wear a jacket/blazer. Was fine for throwing over just about anything while very pregnant. But being open made the snap very noticeable, which was a bit annoying. 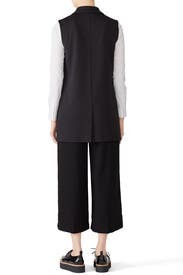 I liked this vest and the material is soft and feels high quality. I didn't wind up wearing this much but it's a good basic piece. 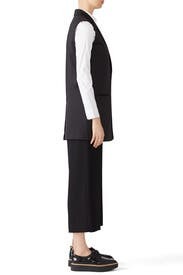 I think my ideal vest would be a bit more structured, this is definitely softer and not very suit like. Like others said, not as structured as I had hoped. Just kind of blends in, less of a statement than had hoped. Really wanted to love it. 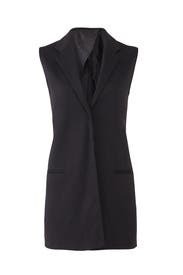 Was perfect for work to wear with black slacks and a statement necklace. I liked the look of the vest open. I enjoyed the vest with a pair of RTR pants. 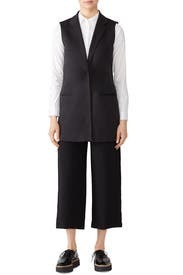 Loved this vest and wore to work multiple times. It's on the dressier side but still easy to dress up or down. I got a lot of compliments on it, and would definitely rent this again! Fun and easy to wear with almost anything! I wore this with jeans to a birthday party and black pants for work - worked perfectly in both occasions. It's structured enough so that it has shape, but not so much so that you can't dress it up or down. Will absolutely rent again! Good fit. Consider going a size up if you want to wear it snapped and you have hips. Otherwise, take your normal size and wear with a pair of pants with big pockets. It's an easy piece to wear.